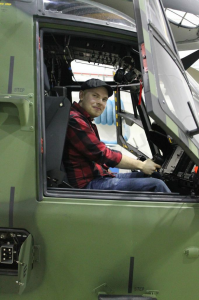 He is currently a student at Aalto University (Helsinki), having just completed his 4th year in aeronautical engineering with a minor in fluid mechanics. He has been born and raised in Helsinki, Finland, and is very excited about working abroad for the first time, hoping to make new friends and international contacts. Niki plays football with his friends, after having been in a football club for 10 years, and also plays guitar. He is also a part of the Finnish branch of association of aerospace engineers (Euroavia). Somewhat unsure of his exact future plans, Niki shares that he would possibly like to work as aerodynamicist for an aircraft company, which would let him combine fluid mechanics and aeronautical engineering. However, when it comes to the choice of the field of work he has no doubts: “Aerodynamics is my thing!”, he says confidently. Niki heard about the summer of HPC through a friend, who also applied. At first thinking he wouldn’t get in, because there’re plenty of other skilled young people in Europe, Niki was happy and excited to find out he got a place. He hasn’t worked with High Performance Computing before, due to the fact that his course work didn’t require it for the smaller fluid simulations he had to do. He has, however, used OpenFoam before extensively, and is now very inspired about using it for more complicated simulations: “I’m very excited to use it for the real purpose now!”. He also hopes to gain an even better understanding of flow simulations, and work with 3 dimensional models (as opposed to the simpler 2D ones he had done before). Niki is an active Facbook user, and a somewhat reluctant Twitterer. He is looking forward to contributing to the Summer of HPC blog, and is almost as excited to read others’ blogs to find out what they are doing. This profile was written by Evguenia Usoskina. You can read Niki’s posts here.